Slain girl's mom to day care crash suspect: "Come forward"
WINTER PARK, Fla. -- As mourners trickled by Thursday to honor the 4-year-old girl who was killed and 14 others injured in a crash at a Florida day care center, authorities scoured the state for the driver they said fled in the vehicle that caused the fatal wreck. The Florida Highway Patrol said police agencies statewide were alerted to look for Robert Alex Corchado, 26, a man with a long criminal history who's accused of sparking the incident when his Dodge Durango hit a convertible, which smashed into the KinderCare building. "We still haven't found him," Sgt. Kim Montes of the Highway Patrol said. "He's had quite some time now. We don't know. We hope he's still in state, but we don't know for sure. We're hoping we can catch him." The Highway Patrol said that Corchado has ties to the Latin Kings gang, CBS Orlando affiliate WKMG-TV reports. The Highway Patrol also said that he could still be in the area and believe that he could have received help from his gang affiliates. 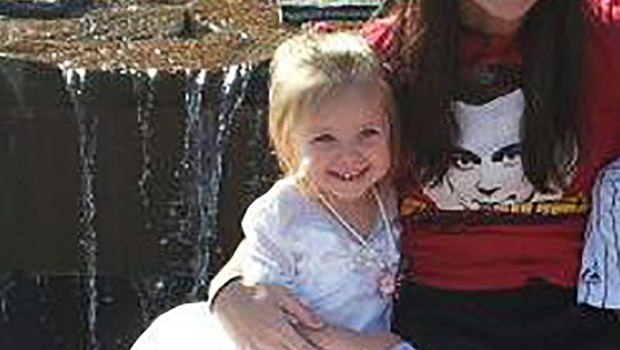 Montes identified the girl who was killed as 4-year-old Lily Quintus. Her mother, Nicole Quintus, pleaded for Corchado to turn himself in. "Come forward," she said in an interview with The Associated Press on Thursday afternoon. "Families are emotionally destroyed because of what he did." The mother softly sobbed as she spoke of her daughter. She said Lily loved princesses, "Star Wars," the TV series "Doctor Who" and ranch dressing on seemingly everything she ate - even pizza and hot dogs. Lily was sitting at a table waiting for her afternoon snack when the car crashed into the building, and Nicole Quintus said a teacher called her soon after, screaming but unable to say what happened. "One minute everything was normal and the next there was an explosion and smoke and screams," she said. The girl's 7-year-old brother is an aspiring engineer who wants to design a time machine to bring Lily back, the mother added. "She was beautiful and passionate and innocent," the mother said, "and she deserved so much more." Lily Quintus was on the minds of those who turned up at the day care, where the gaping hole was boarded up with plywood and a cluster of stuffed animals, flowers and candles were left in memoriam. Ralph Velez, 48, left a stuffed bear from his 5-year-old son Xavier, who goes to the day care but was unhurt. The bear was a gift from a few Christmases ago, and Xavier - who can't stop talking about the crash - wanted to give it to honor his friends, Velez said. "He'll say, 'stupid car,' or 'stupid driver,'" Velez said. "He told us last night that he remembers the driver getting out and saying, 'What did I do? What did I do?'" Local television footage showed small children and infants in cribs being taken outside to the day care's playground in the Wednesday incident. Several of those injured were carried out on stretchers. Parents were later seen waiting to pick up their children, then clutching them in their arms as authorities escorted them to their vehicles. Corchado has been arrested eight times since 2000. Department of Corrections records show he served prison time for trafficking cocaine and extortion. He most recently was arrested in December on a misdemeanor charge of leaving the scene of a crash involving damage, a felony charge of selling narcotics, and felony marijuana possession. He was released on more than $10,000 bond and pleaded not guilty to the charges. He was due back in court in May. Jack Kaleita, an attorney representing Corchado in that case, did not return a call seeking comment Thursday. A man who answered the phone at a number listed for Corchado hung up. In all, 13 people were hospitalized and two others were treated at the scene, authorities said. Eleven of the injured were children, said John Mulhall, a spokesman for the Orange County Fire Rescue. Besides Quintus, seven victims were brought to the Arnold Palmer Hospital for Children, where one remained in critical condition Thursday and two in serious condition. The day care's website says the center provides childcare and learning opportunities for children up to 12 years old and has been in the community for more than 25 years.